Starring mens suit & tie. This is Magic with a capital M! This star-rich suit is great for any occasion when you need to stand out from the crowd. 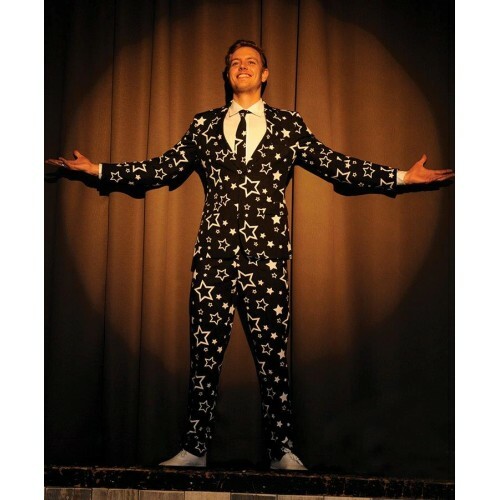 Whether it's a quiz, a work night out or some other flashy event, this star suit ensures you will be the main entertainer of the night. All of a sudden, entertaining people will be dead easy by wearing the Starring. Wearing this star costume to a formal ball may raise a few eyebrows but that's not to say that people don't like it! Jealousy is the right word. The astronomers and astronauts within this world finally have something appropriate to wear when they go to work in the morning too. We're wondering whether Neil Armstrong wouldn't rather have travelled into space in this?